Some synthetic pot products sold in Illinois are causing people to develop severe bleeding and have been linked to at least two deaths. The outbreak of severe bleeding cases linked to synthetic pot in Illinois is getting worse with every day. 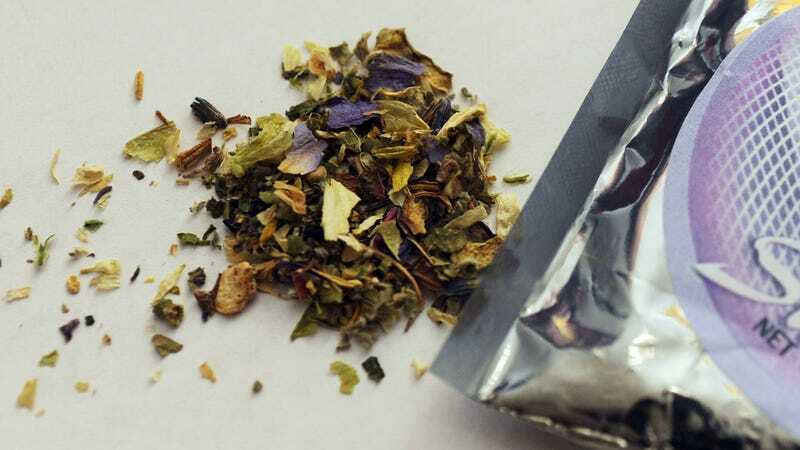 On Tuesday, the Illinois Department of Public Health (IDPH) reported a second death in connection to the designer drugs, also known as synthetic cannabinoids. As of Tuesday, there have been 56 reported or suspected cases of people coming down with strange, serious episodes of bleeding soon after having used synthetic pot products. People have vomited up blood, bled from their eyes and ears, and experienced large, unexplained bruising. All have been hospitalized, and several have relapsed and needed to be readmitted, according to the IDPH. Synthetic cannabinoids, sold under such names as K2 or Spice, are smokable herbs doused with a cocktail of chemicals advertised to mimic the effects of marijuana; they can be also sold as vaping fluid. The enforcement of these drugs was initially nonexistent, allowing them to be presented as a safe, legal alternative to pot and sold in convenience stores and head shops. In recent years, many states, along with the federal government, have tried to ban specific ingredients found in these products, but manufacturers have largely stayed one step ahead by constantly changing their formulas. Because the ingredients are generally unknown, however, users can experience dangerous and unexpected side effects, including temporary psychosis, hallucinations, and sometimes death. And several outbreaks of synthetic pot overdoses have hit other states, including New York, recently. The recent outbreak is believed to be the first time any of these ebola-like symptoms have been associated with the drugs, though. There remains no single common identified source of the outbreak. At least 14 patients had purchased their drugs from a friend or store in the Chicago area beforehand, but cases have and are expected to appear throughout the state. All the cases are believed to have occurred since March 7. An IDPH spokesperson told Gizmodo that some patients had evidence of brodifacoum, a common pesticide that’s used as an ingredient in rat poison, in their system. Brodisacoum and similar chemicals are vitamin K antagonists, meaning they block our cells’ receptors from taking in the vitamin. In high enough doses, it can act as an amped-up blood thinner that stops the body from being able to clot blood. So far, at least nine patients have tested positive for the chemical. IDPH had earlier advised pharmacies to stock up their supplies of vitamin K to help patients recuperate. The IDPH plans to update its tally of victims every day for the time being. People who develop symptoms of serious bleeding or unexplained bruising after using these products are advised to immediately have someone take you to the hospital (do not walk or drive there by yourself! ), or call 911.